The On-Time automatic Fish Feeder Combo comes ready to install with a 85-lb. capacity hopper & a steel attachment band with welded brackets. 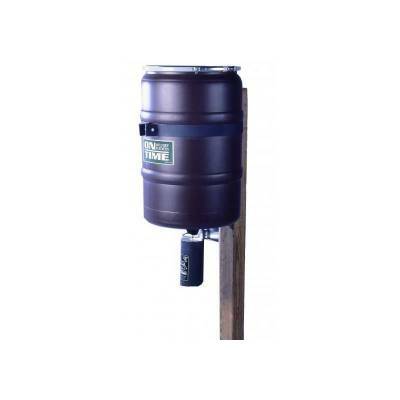 Specially designed to dispense round and cylindrical fish food, ideal for maintaining catfish, bream and other varieties of fish. Featuring large-scale motors with agitator rods that extend into the hopper. As the auto fish feeder dispenses, the agitator rod turns, keeping the feed flowing properly and preventing clogging. Comes equipped with a deflector plate that allows for uses as a directional fish feeder. Easily mounts to a 4"x4" wooden dock post (not included).